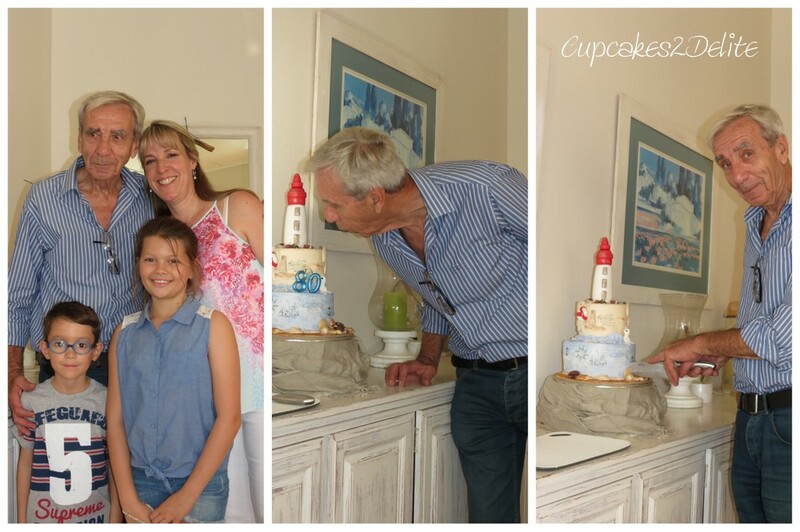 My dad turned 80 last week and we celebrated with family and friends in Durban on a beautiful spring day. 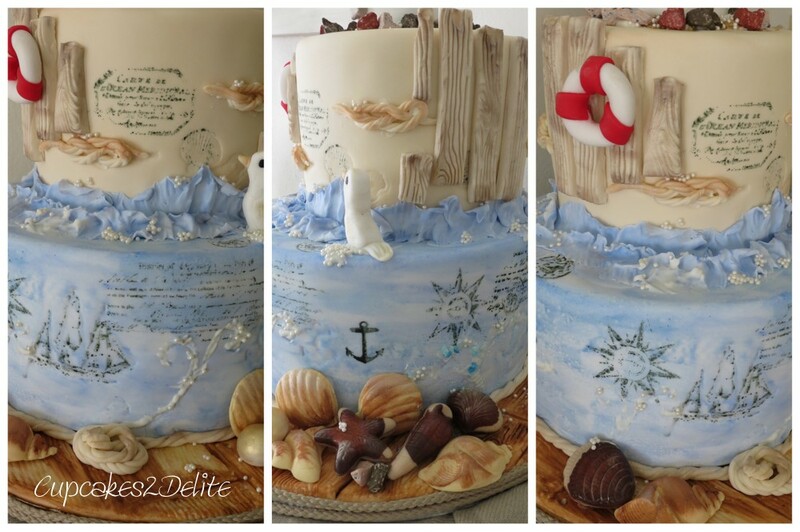 I had the privilege of making my dad’s birthday cake and I knew I wanted to include his passion for the beach and the sea in this cake. I started with a boardwalk sugar paste board and then added the first layer, a chocolate fudge cake, which I painted in shades of blue and white for the sea. The stamped images portray my dad’s passion for boats and everything nautical. The second tier represents the sand on which my dad spent so many hours playing sandcastles with us his children and now his grandchildren. I chose a salted caramel flavoured cake for this tier. 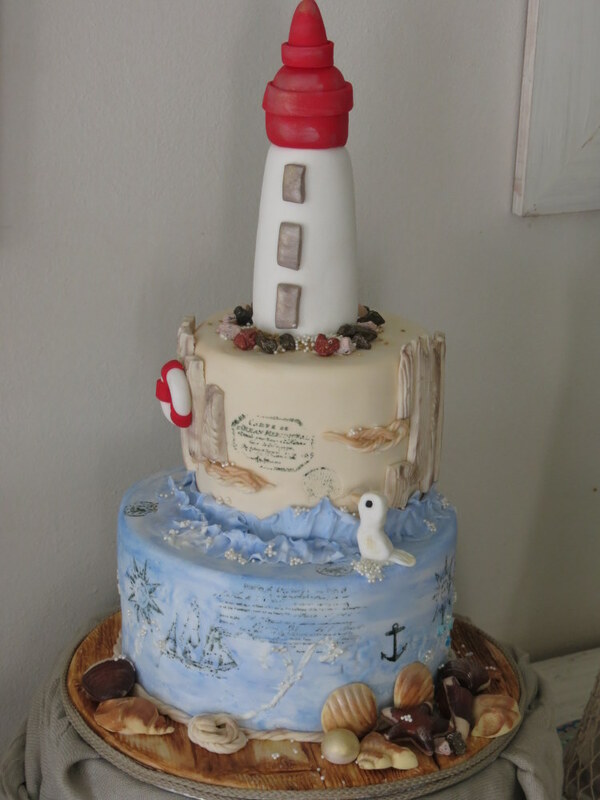 I had the waves gently kissing the 2nd tier and added wooden sugar paste posts to represent the many hours spent walking along the Umhlanga boardwalk. Finally the lighthouse nestled in the chocolate rocks was the most important as my dad has always been and will always be an inspirational beacon in all our lives and the lighthouse represents his guidance, help and protection in our lives. I asked my niece and nephew to add their creations to the cake and Tanith made a beautiful seagull and Roarke made a golden beach ball. A sugar paste life buoy, rope, sea shells and miniature beaded bubbles were the final inspiration for the most incredible dad! I was touched by how much my dad loved his cake and he became quite protective over it when it came time to cut and share his beautiful cake. Happy 80th Birthday Dad! I love you!